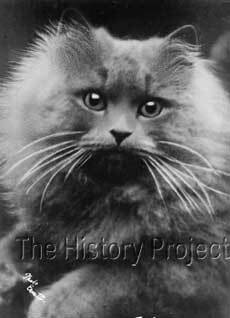 Not all breeding cats are show cats, and Mrs. Harper's 'Waterloo' fell into this category. There are no records of him ever being shown and only a cursory examination of his photograph, possibly reveals the reason why; a sizeable chunk out of the tip of his right ear. This could well have been an injury obtained in a fight with another male, or in having been put with a female who objected to his company. Certainly injuries sustained by stud cats from visiting queens were not uncommon, one that immediately comes to mind being Mrs. H.B. Palmer's Chinchilla male 'Otto', who was robbed of his show career by receiving an injury to his eye, in just such a manner. 'Waterloo' appears to have had but two claims to fame, one as the son of one of the veritable foundation Blue Persian males, 'Champion Turkish Delight'(NCC:1644); and the other, as the sire of Mrs. MacKenzie Stewart's much-admired 'Champion Ayrshire Ronald' (NCC:3050, originally known as 'Ronald'). Although it is unclear as to who actually bred 'Waterloo' we do know that his owner was Mrs. Harper and that his sire was 'Ch. Turkish Delight' (born in 1887), owned by Mrs. Marriott and his dam was a queen named 'Daisy' (one of many by that name!). Of significance here is that his sire stands among the great foundation Persian males and among one of the first blue Champions of record. This valuable collection of males were all born in the 1880's, and among their number are the likes of Mrs. Shearman's Blue Smoke, 'Ch. Perso'; Mr. Goodwill's 'Old Jumbo' (the grandsire of the blue,'Wooloomooloo'); Lady Gaskell's 'Turco', (the grandsire of the blue 'Ch. Glaucus'); and Mrs. Pell's 'Thunder and Lightning' (the sire of 'Ch. Bundle'). It was from this exclusive club that the Persian breed grew from its British infancy and that recorded pedigrees and the passion to create the 'pure Blue' took root. In this sense, 'Waterloo' stands alongside 'Ch. Bundle', as a first generation son of a foundation cat. Mrs. Marriott is likely to have imported 'Turkish Delight' but his origins remain shrouded in mystery, as do those of most foundation cats. But that so many breeders flocked to use him, stands testament to how handsome he must have been in their eyes, coupled with the fact that he was among that earliest band of blues that could lay claim to being a "Champion". Due to the fact that the sire of 'Waterloo' was a major foundation male, with a lengthy list of progeny, 'Waterloo' was in excellent company for sire siblings, certainly too numerous to list here. 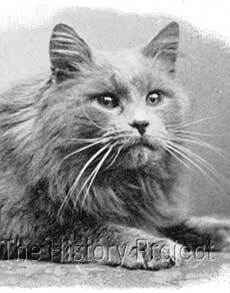 But probably his most noted half-brother was a blue male bred by Mrs. Marriott, (the owner of his sire, 'Ch. Turkish Delight') whom she sold to the Misses Beal. And that male was the reknown 'Romaldkirk Laddie'. 'Laddie' of course, was in turn the sire of "The Heavenly Twins", the cream males 'Romaldkirk Admiral' and 'Romaldkirk Midshipmite'. What is not so well known is that many of the early blues had silver breeding behind them, and 'Laddie' was not an exception to this rule, with his dam's grandsires being 'Eng.Ch. Perso' (a blue smoke and the sire of the world famous Chinchilla 'Ch. Silver Lambkni), and 'Silver Laddie' Mrs. Balding's outcross Chinchilla male, from whom he may well have taken his name. Other sire siblings of note include 'Blue Dora' bred by Miss Finnie Young out of 'Stella'; 'Jessamine', and 'The Mac Turk', bred by Mrs. MacKenzie Stewart, out of 'Ayrshire Bluebell; 'New Forest Syren', bred by Miss Hester Cochran, out of 'Carmen Sylva'; 'Staplegrove Pasht', one of many sire siblings bred by Mrs. H.D. Ellis, out of 'Staplegrove Moonie'; and 'Turkson', bred by Marriott, out of 'Peerless'. 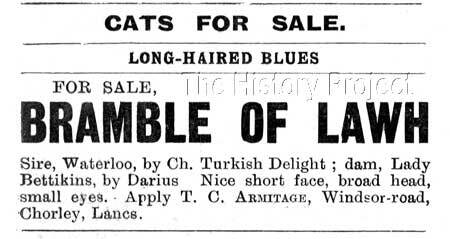 Between 1898 and 1904, 'Waterloo' sired a number of 'pure blues' for a couple of handfuls of breeders. His most famous son, was one of his earliest, when Mr. J.A. Doyle of The Cottage, Bristol Gardens, Brighton, bred his queen 'Hazel' to 'Waterloo' and from this combination came the blue male named 'Ronald'(NCC:3050), born in 1898. Volume Three of The Cat Club Register provides clear proof of the subsequent transfer of 'Ronald' into the ownership of Mrs. MacKenzie Stewart, at some time during 1899. It would have been due to this change of ownership, that his name from that time forward was known as 'Ayrshire Ronald'. 'Ch. Ayrshire Ronald', bred by Mr. J.A. Doyle, and owned by Mrs. McKenzie Stewart. 'Ronald' in his time sired a plethora of blues, among them two well-respected males, namely 'Sir Archie of Arrandale' and 'Don Carlos'. 'Sir Archie' was the sire of 'Eng. Champion Sir Archie II of Arrandale' while 'Don Carlos' was the grandsire of the 'Champion Oaklands Sceptre', via his daughter 'Donna Ulsterina'. Left: 'Don Carlos' a grandson of 'Waterloo' by 'Ayrshire Ronald'. From 'GARBOLDISHAM SHEILA', in a litter born 20th March, 1900; bred by Mrs. C.L.Kennaway, a blue male and female, 'Garboldisham Blucher' and 'Garboldisham	Damsel' respectively. (OC:25/Feb/1901)9 and (OC:26/Apr/1902)10. 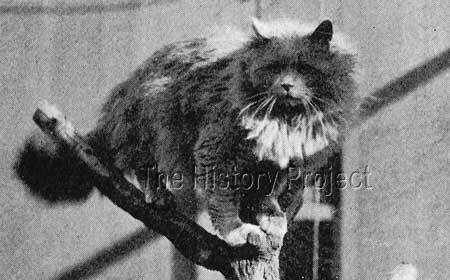 From 'BONNY' in a litter born 22nd August, 1900; bred by Mrs. E. Gill, two blue females, 'Alex' and 'Aliz'. (CCR:v5)3 & (OC:17/Aug/1901)11. From 'WINDSOR HAZEL' in a litter born 21st May, 1901; bred by Lady Marcus Beresford, a blue male, 'Windsor Hazelnut'.(CCR:v5)3. 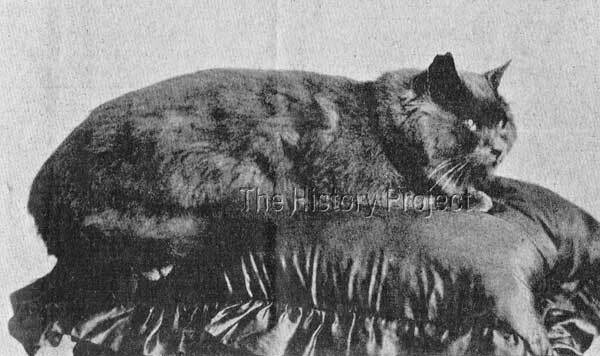 From 'BONNIE MOUSIE' in a litter born 5th April, 1904; bred by Mrs. Blackett, a blue female,'Mousieplush', sold to Miss H. Swanston. (OC:07/Jan/1905)14. From 'TRICKS' in a litter born 28th April, 1904; bred by Mrs. Harper, a blue male and two blue females, 'Holton Minstrel', 'Holton Robina' and 'Bud' respectively. 'Bud' was sold to Mrs. Hellings. (OC:03/Sept/1904)15	and (OC:24/Dec/1904)16. 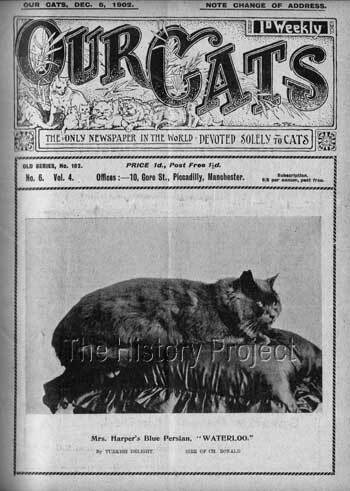 And interestingly, we find a blue shorthair neuter!, sired by 'Waterloo' with dam unknown, named 'Prince Rupert' in The Cat Club Register, bred by Miss Harper and owned by Miss Evelyn Gaubert. Mrs. Harper's 'WATERLOO', by 'Turkish Delight'. 'Bramble of Lawn' (with name mis-spelled). Through 'Waterloo' we have taken a glimpse into the distant past, to the early origins of the Persian breed and into the mists shrouding the specifics of the foundation Persian males of record. But we have also seen, how from such cats, were built the pedigrees of today, and how in just a few short generations, the concept of a pure blue was born and quickly established. Through 'Waterloo' to his son, 'Ayrshire Ronald' and his grandsons 'Sir Archie of Arrandale' and 'Don Carlos', we can trace the establishment of a variety of mixes and blends of bloodlines and to creation of well-known catteries, recognised for their contribution to the establishment of the Blue Persian as a tour-de-force. Although these beginnings were humble, the breeders took what they could from what they had, and by selectivity, pulled from the gene pool those traits which they saw as best representing their aims or desires. That they succeeded in so short a time is nothing short of amazing. And it has been the continued efforts of breeders following in these foot-steps, over the decades since, who have made it possible for the Persian cat to dominate the show circuit for nigh on 140 years.